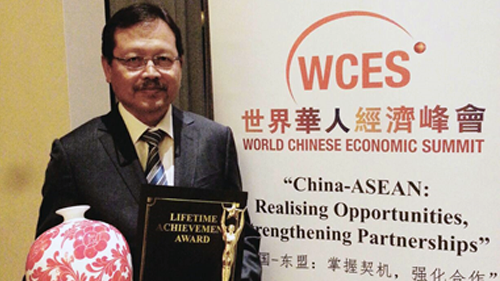 Melaka, 16 November 2016 - 10 years of dedication and commitment towards helming the development of Malaysia’s Halal Industry, Dato’ Seri Jamil Bidin, Chief Executive and Managing Director of Halal Industry Development Corporation received the Lifetime Achievement Award for Leadership in Global Halal Industry during the World Chinese Economic Summit (WCES) 2016. The summit was held in Malacca, on 16 November 2016. WCES is organised by the Asian Strategy and Leadership Institute (Asli). The Lifetime Achievement Awards was introduced in 2011 to honour individuals who have made significant fundamental contributions in their respective field of work. Dato’ Seri Jamil received the award from Malacca Governor TYT Tun Datuk Seri Utama Mohd Khalil bin Yaakob , at a dinner hosted by the Malacca State government last night.